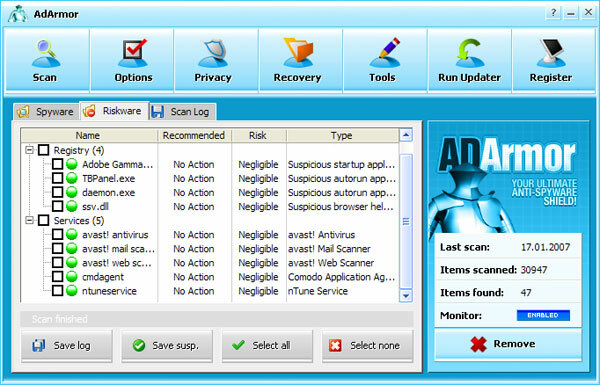 Ad Armor is a corrupt anti-spyware program that uses false positives as goad to purchase. It's not only a poor performance product, but also a clone of numerous corrupt applications. We have carefully tested the program on absolutely clean computer that was never infected with any viruses, spyware or other malicious threats. Nevertheless, Ad Armor managed to detect 6 infected files. Further analysis revealed that neither of detected objects was actually malicious. For instance, files td.exe, tlink.exe and arj.exe were essential parts of ALAB, Assembler IDE. That's an old program, but definitely not harmful. Other files identified – pdfl70.dll and ssupdate.exe were associated with Adobe Illustrator and SUPERAntiSpyware, popular and fully legitimate software. Take a look on the screenshot provided below. Ad Armor also detects suspicious software. 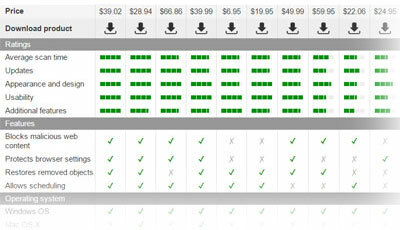 Not surprisingly, this detection is also inaccurate. For instance, the spyware remover says that Java, Adobe Gamma, avast! Antivirus, Comodo Firewall, Daemon Tools, NVIDIA and Gainward drivers are suspicious programs. See another screenshot. We have also used the program to scan a badly infected machine. Results are horrible. The only threats the application could detect were tracking cookies and a few files of Surf SideKick and Internet Optimizer. 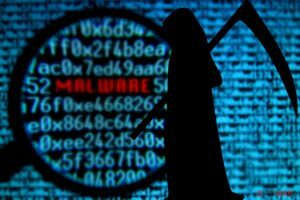 Neither of downloader trojans, adware parasites and hijackers was found. What is more surprising, a lot of malicious registry entries were identified after all, but only as riskware. The program's recommendation was simply “take no action”. The application's free version refuses to remove any parasites it finds. It asks to register and purchase the full product. It must be noted that spyware definitions database updates do not work. The application's home server provides a newer database version, but Ad Armor refuses to download it without obvious reason. 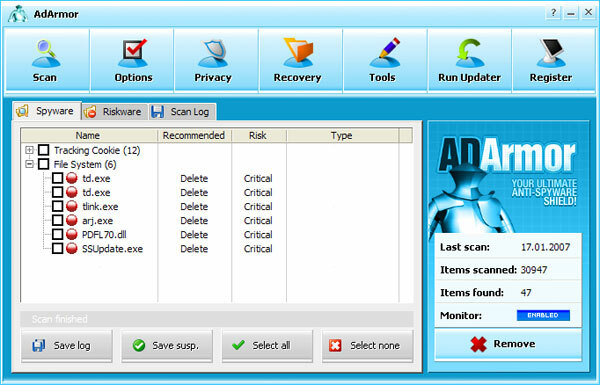 The program is a clone of ADWare Bazooka, Adware Punisher, Hit Virus, Remedy Antispy, SpyCut, Spy iBlock, SpywareDisinfector, SystemStable, The Spy Guard, Break Spyware, Spy Officer, Spy Analyst and Fixer AntiSpy. All these applications have resembling interfaces and consist of terribly similar components. This entry was posted on 2012-12-03 at 04:39 and is filed under Corrupt Anti-Spyware, Software.